Is Acropolis a good or bad citizen of Elmwood Avenue? Are we knee-jerkedly predisposed in Buffalo to discourage and punish success? Do you live within earshot of one of the city’s busiest commercial districts because you treasure peace and quiet? Acropolis on Elmwood, fresh off a recent renovation and expansion, is looking to further expand to the second floor. Some people in the neighborhood are opposing this – some reasonably, some with libelous outrage. The city has already approved the work that Acropolis is doing – adding space to the second floor for small banquets and parties; it’s not a huge building. Yet some residents nearby are engaging in blood feud tactics to protest what they think will become a “nightclub atmosphere” in the miniscule second floor. Isn’t that a good thing for a city – increased traffic and less parking? Doesn’t that mean we’re doing something right? And how will a soundproofed tiny banquet area increase noise or “safety concerns” any more than Cecelia’s next door, or Blue Monk across the street, or any of the other nearby bars or restaurants? What proof is there that a thriving Elmwood business district will adversely affect property values? Any more than, say, break-ins to cars and homes, underperforming schools, theft of architectural features? Let’s be real – if you want quiet and ample parking, you don’t live in the Elmwood Village. If you want a walkable, thriving, vibrant neighborhood that brings with it the headaches of living in a city environment, you do. It’s really that simple. It’s like moving to the airport and complaining about the planes. While Buffalo Rising has seen far more people in favor of the expansion, what critics now seem to be misunderstanding is the music. Acropolis is simply not a place for overly loud music. It’s a place where a DJ can play eclectic trendy music to cater to the bar. People can still have conversations over the music. This type of relaxed bistro lounge atmosphere with DJ is popular with young professionals and has been for some time. Right now, though, the City of Buffalo is holding his music license, so he is prohibited from playing music until the Common Council decides what it is going to do on January 24th. Tsouflidis is reaching out to his critics, calling for an open community meeting, followed by a tour of the new upstairs space where the entire community can come out and learn more about the project and have a dialogue about any concerns that they may have. It will be critical for supporters of the expansion to also attend this meeting or contact Delaware District Common Council Member Michael LoCurto’s office at mlocurto@city-buffalo.com to voice their support. The meeting will be held on January19th at 6:00, in the Lafayette Ave. Presbyterian Church, downstairs in the loaves and fishes room. The expansion of Pano’s several years ago was also riddled with controversy. Having a nice place to sit, have a drink with friends, and be able to hear your conversation is what adult city dwellers like to do. The protests against this are reminiscent of the neighborhood protests that ended a planned hotel at the corner of Elmwood and Forest, near Buff State. It’s a sorry state that businesses have to spend money and energy responding to – and often succumbing to – propaganda and lies, unless they’re well-connected and donate money to the right people, in which case they can, for instance, taunt politicians from illegal billboards on ironically crumbling, speculatively owned buildings. Maybe Acropolis should be a future Cash Mob destination. Dale Volker is the poster boy for out-of-touchedness among our politicians “serving” western New York. When the cops told them they couldn’t go onto public property to protest Volker, the cops were wrong. Erie Basin Marina is quite clearly publicly owned property, although parts are operated by a private concessionaire with ties to City Hall. 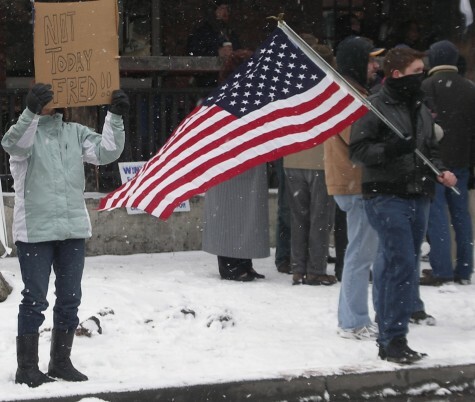 The protesters obeyed the police order to stay off of public property and stay on other public property. How come? The cops were wrong. Waltz onto the Marina grounds. What’s Volker going to do? Have you arrested? That would have been awesome to use against him during the next election. Last month, I wrote about Buffalo’s push to install red light cameras at key intersections throughout the city. Far from being a safety measure, these cameras are nothing but a cash cow for the city. Rather than improving motorist safety, red-light cameras significantly increase crashes and are a ticket to higher auto insurance premiums, researchers at the University of South Florida College of Public Health conclude. The effective remedy to red-light running uses engineering solutions to improve intersection safety, which is particularly important to Florida’s elderly drivers, the researchers recommend. 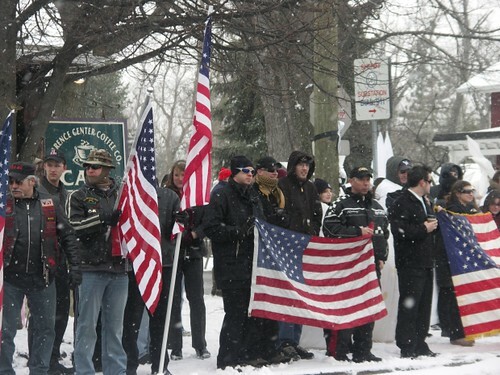 The Shredd & Ragan show is organizing a protest Tuesday – be in McKinley Niagara Square, in front of City Hall at 1:30pm. EDIT: The release I received called it “McKinley” Square and I didn’t change it because I figured people could figure it all out. A sorrier little trio of morons I’ve seldom seen. About 100 average western New Yorkers from around the area came to Clarence Center to tell the hateful cretins to take it someplace else. No one wants these fools to preach hatred in our towns. 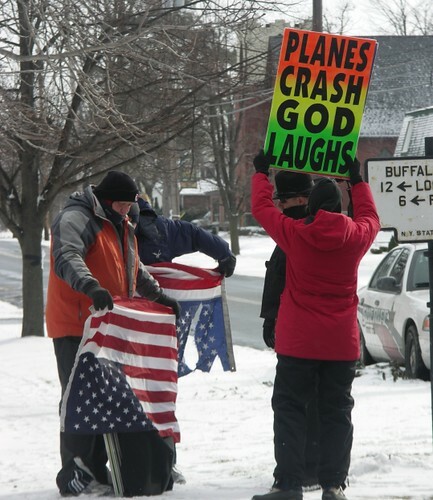 No one wants these idiots to disrupt church services or preach their ignorant hatred. 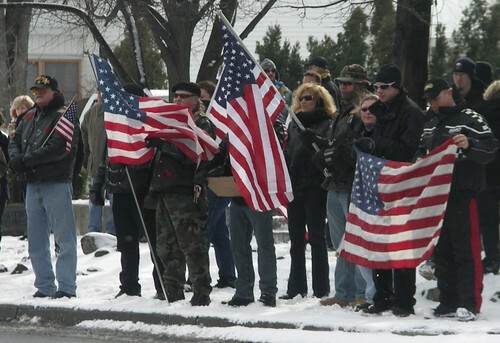 No one wants a bunch of morons to disrupt a memorial service for the victim of a plane crash. 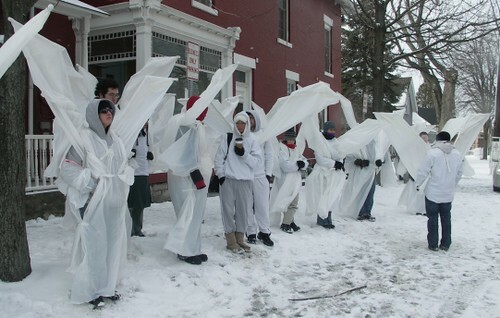 In WNY, Fred Phelps’ sorry group of cultists got pwn3d. Photos courtesy of NY_Lucy at Flickr, who wrote about it at Artvoice. You can read all about it here (with a special Jim Ostrowski comment about “socialized roads”). I won’t be going. If the protesters had any sense of irony, they’d go protest during the height of afternoon rush hour on any given weekday. I’d say 5:15 pm. After all, why not publicize their point of view to the people whom it most directly affects? There aren’t any residents out on the Outer Harbor adversely affected by Route 5. There aren’t any businesses adversely affected by Route 5. The only people affected would be commuters. That’s the only rational target audience. 10am on a Saturday? Total cop-out. Last week, an old Buffalo building began to crumble and fall. It wasn’t hit by lightning or a Cessna – it began to crumble from its own weight due to years, if not decades’ worth of neglect from the owners, who had it on the market for $400,000 – a price that the market evidently couldn’t bear. There aren’t too many people around in town who can throw down $400 large for a building and then invest a like amount to shore it up, much less renovate it. So, as usual in Buffalo, another building bites the dust. Also as usual, a band of reactivists gets vocal, files for injunctive relief, and decries how the demolition of the building would ruin the city, “destroy the fabric of the community”, etc. Too late for all that now. Unless you have the scratch to buy it and fix it yourself, it’s probably coming down. Yes, the owners should be required to pay for the demolition. In a perfect world, they’d pay for the neglect that was the proximate cause of the demolition. But in Buffalo, the basic shoring-up work needed to keep an allegedly $400,000 building standing isn’t done. It’s permitted to crumble, because there is no incentive not to. The grassroots effort to save the building has a website here. I find it pitiful and despicable that a group of regular citizens has to raise money to help save a building privately owned by a tone-deaf owner who is wealthy and doesn’t seem to give a crap. The photo used above is taken from their website. Buffalo Geek and I spoke about this on Friday, and his notion is that the preservationist community, which is seen as somewhat of a joke outside the Elmwood/Buffalo Rising bubble, would do itself a lot of favors if, instead of just being loud and obnoxious, it took action once in a while. His idea is that they should solicit some like-minded local charities and otherwise raise $1 million per year, and select up to five buildings to save every year. They could not only make their point, but actually do the work. How? Well, maybe the city takes the buildings by eminent domain and transfers title to the preservationist non-profit for one dollar. The work is done, and the building is marketed as a fundraising vehicle for the next round of rehabilitations. It’s one thing to hold rallies and hold up signs after it’s too late. It’s another to actually do it. Like, say, Buffalo ReUse does. There are tax credits and other incentives available for these rehabs. If the preservationists don’t know how to get them, no one does. So, the bubbleistas hold up signs decrying the newest pair of demons, Nina and Bob Freudenheim. They allege that the couple, whose company owns the Livery Building, should be required to pay for the demolition. Yes, and they should have been required to maintain the building to code, too. They’re right, of course, but it’s too little, too late. The allegation that the demolition of the building will ruin the “fabric of the community”? Well, I’d argue that a neighborhood and the people in it make up the fabric of a community – not buildings, no matter how old or pretty. But when the Elmwood Hotel at the corner of Elmwood and Forest was being proposed in 2005, Nina Freudenheim, who lives on tony Penhurst and (one would surmise) is a person of some means who could have afforded to do the very bare minimum to shore up the Livery building, was among the plaintiffs who sued to block the hotel. The argument given by hotel opponents also echoed the “fabric of the community” arguments we often hear when this sort of thing goes on. It’s all somewhat ironic. The renovation of these beyond-help old buildings which teeter between demolition for safety and preservation for history, would happen far more often if we had an economy that worked. If we had more and more widespread wealth, we’d have more people willing and able to do this kind of work. If we had a growing population and more vibrant economy, the preservation of buildings like the Livery would be a foregone conclusion. Whatever happens to the Livery, one hopes that it might be a wake-up call to loads of people. There should be protests and placards against dumb policies, laws, and politicians who help perpetuate this state of affairs in which we find ourselves. If buildings are worth saving, then action trumps reaction. It’s not so much about the buildings – it’s about the people.